For years I didn't know how to use bronzer correctly, well I did but I thought my way was better! My way consisted of slapping a large amount of shimmery bronzer all over my face. Not content with having a shimmery bronzed all over look I would also use it as my blusher... as you can imagine I must have looked a dream! Although when applying bronzer to other people I wouldn't do it that way, but for me I liked to fully bronze up my very pale face! Of course I would also bronze my neck, I was never one for the thick orange jaw line.... just the thick orange all over face look! Look before you cast some horrible opinions of me, I'm sure we have all been there at some point in our lives! Thankfully I learnt my lesson. Although I do still like a bronzed look as I'm naturally pale and hate the dead look on myself, I did get rid of the shimmery bronzers and now stick to applying bronzer to the contours of what I class as a huge football shaped face! (I still bronze my neck as it's a lot lighter than my face) I now stick mainly to matte bronzers OR a bronzer with a barely noticeable shimmer to it. 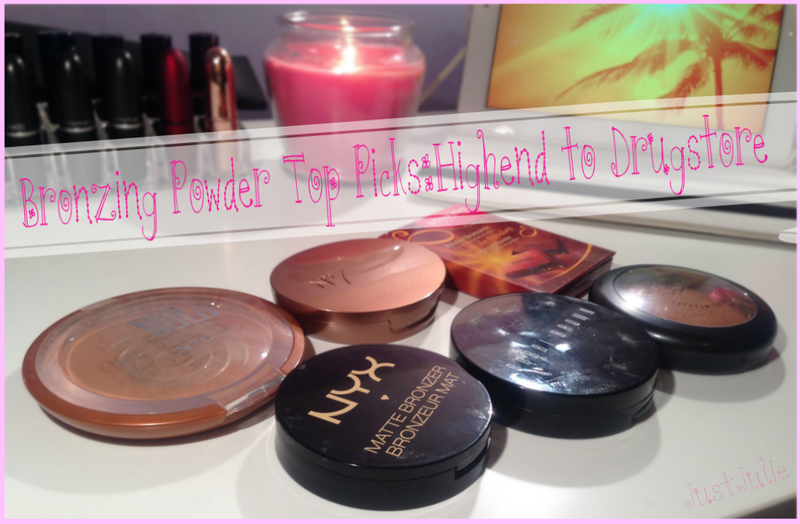 Read on to find out my top picks for bronzing powders! No7 Perfectly Bronzed Dual Bronzer, 10g £12.00: I used to work for No7 and was never a fan of this, I always opted for the shimmery bronzing pearls they sold but wish I had just used this. I love that it's a duo bronzer. One side is a shimmery highlighter and the other half is a matte pink based bronzer. You can either mix them together to get a light bronzed look OR like me use the matte side to contour and the other side to highlight. It also comes with a mirror which makes it a great bronzer to use whilst on the go. Bourjois Delice de Poudre Bronzing Powder, 16.5g £6.99: The Bourjois 'chocolate' bronzer is a classic, I don't think there are many people who haven't got this in their collection but funnily enough this has only recently found it's way into mine. Who doesn't love a bronzer that 1. looks like a chocolate bar and 2. actually smells like Cadburys chocolate? I actually have to remind myself not to eat it, and being on a diet (well trying and failing) makes it that bit harder! This is again another matte bronzer with literally microscopic glitter that is virtually impossible to see once on your skin. I like that this isn't too dark and you can build the colour up if you feel you need to add more. NYX Matte Bronzer in Medium, 9.5g £8.00 This is probably my favourite out of all the drug store bronzers. It's a virtually an identical dupe for my favourite bronzer at over a 1/3 of the price! This has a brown undertone as opposed to the orange tone that we see in most bronzers. You do need a light hand with this as it's very pigmented and it's easy to go a bit over board. It comes with a mirror too which I like. Only downside it's quite powdery so product gets wasted and you can make a big mess with this. Bobbi Brown Bronzing Powder in Golden Light, 8g, £27.00 So this is my favourite out of all the bronzers I own and also is the most expensive which kind of makes me want to cry! I mean how can I warrant spending £27 on a bronzer??? I never even realised how much this cost when I originally bought it either which makes it even worse! This for me is the perfect colour. Totally matte. No orange tone and not powdery at all, which means you're not wasting product (at £27 I can't afford to waste product!) You get the right amount of colour to your skin which means you can't go OTT. It also has a mirror included with it. The problem is this has the least amount of product in it compared to all the others and it's the most expensive.... I've hit pan and honestly can't decide whether to repurchase or not BUT it is my favourite out of them all! MAC Mineralize Skinfinish Natural in Deep Dark, 10g, £22.00: So officially this isn't a bronzer but I see a load of YouTubers use this instead of an actual bronzer, no doubt because all of MAC bronzers are completely orange based, which surprised me! Mind you pro stores may do more but my local MAC is a HOF concession that doesn't stock the pro lines. On a first swatch it does look shimmery but I can assure you once it's on the skin and blended in you can't see any shimmer. You only need to use a small amount of this and that's it, job done! I do like this a lot and it's been my go to bronzer most days lately, but because it's not a bronzer it's quite powdery, which if you haven't guessed already, I dislike powdery bronzers as I feel it just wastes sooo much product. So those are my top picks for bronzers. Do you use any of these? If not what bronzer would you recommend I try next?